Your complete source for supermarket equipment, installation, and service. The Leaders in Refrigerated Equipment Remanufacturing. We provide complete refrigeration equipment sales, installation, and maintenance services for convenience stores, supermarkets and grocery stores. Perfectemp is dedicated to delivering the best in refrigeration equipment and expert knowledge with years of experience. Are you wondering how you can GO GREEN and save money? We are happy to announce our new 2 year case warranty beginning January 1st, 2018! Visit the link below to view our warranty. "Report highlights potential for remanufacturing to reduce both costs and carbon, with refrigerated display cases selected as a key area for improvement." Need to finance your next project? Apply today for special finance offers through Marlin Finance. For information regarding Recommended Maintenance Specifications, click the link below. Thinking of purchasing a series of deli cases to keep your meats and cheeses as fresh as when they first arrived on your shelves? 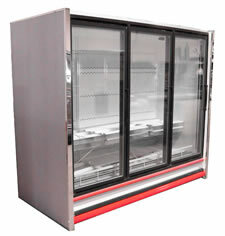 Or are you considering a set of reach-in door cases that lets customers see the full scope of your frozen food selection? No matter what you need, when it comes to keeping your merchandise cold and on display, we've got all the answers. Nestled in the mountains of Auburn, Pennsylvania, our 136,000 square foot facility contains the largest variety of refrigerated retail equipment in the country. With a total on-hand supply of over 2,000 units of retail cases and refrigeration equipment from every major manufacturer, our ability to meet your needs is unmatched. Additionally, we are always in the process of acquiring products to offer our customers, so don't forget to keep an eye out for new specials! We're easy to find! We're located just minutes off of Route 61, north of Route 78 and south of Pottsville. We're almost 15 minutes north of Cabela's Retail Store in Hamburg, PA.
Perfectemp Refrigeration has been family owned and operated since 1987. We make our success personal - and our customers have benefited from that vision for decades. From our humble beginning as a single technician in a service van in the late eighties, we have continuously improved to meet the needs of our customers over the years and have enjoyed exponential growth and success. Now, Perfectemp Refrigeration is not just an industry leader but an innovator in the field, setting the bar of expectation high and always finding new ways to serve our loyal and ever-growing customer base. Mon-Thurs: 7 AM - 4:30 PM E.S.T. Friday: 7 AM - 3:30 PM E.S.T.